One Horsepower (hp) is the force needed to lift 550 lbs. one foot in one second. If you ask Tim "The Tool Man" Taylor, he'd invariably tell you, "It needs more power." The CFM (cubic feet per minute) the compressor can produce is most important. Typically though, the more horsepower, the more power the compressor will have and the higher CFM it can produce. This isn't a muscle car so don't shop by horsepower. Shop by CFM needs instead. CFM is the most important factor in determining what air compressor works for you. Every air tool has a CFM requirement. The higher the CFM, the more air volume the tool uses. Many garages will power multiple air tools off one air compressor. Regardless of how many tools you are running simultaneously, you will need to estimate how much CFM you will need to power at any given time. Total the CFM of tools in use and make sure the compressor can handle the work load. Tools that require constant power, such as grinders or sanders, will require more CFM than tools which need sporadic power, such as nail guns. The main difference in voltage and single vs. three-phase is where you will be using your compressor. In a residential setting, you will be dealing with single phase. 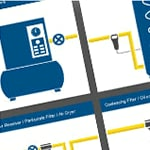 Make sure you know what type of wiring you are dealing with before buying a compressor. With many different types available, you'll find one to fit your needs. Three phase electricity is found mostly in industrial settings. Three phase power is considered more efficient and will result in less wear and tear on your motor. Voltage and phase vary by location so consult your local codes and electrician before purchasing. The size of the tank on a two-stage air compressor is measured in gallons. They can range from 60 - 200 gallons. The size of tank you need is predicated on the how often the compressor is in use. Start-stop air compressors run until the tank is full of compressed air. As you use air tools, the PSI from the tank is depleted. Once this reaches the low setting, the compressor turns back on and refills. If your compressor is starting and stopping too frequently you run the risk of overheating which can damage the pump. Constant-run air compressors run 100% of the time but regulate the air output as needed. Two-stage air compressors come in two styles: horizontal or vertical. Your space requirements or limitations will determine which style to buy. If you don't have a wide area to run one in, get a vertical compressor. Likewise, if you are storing the compressor up high and have height limitations, choose a horizontal model. There is no difference in performance and utility of horizontal vs. vertical compressors of equal power. They are the same machines, just built in different styles. Two-Stage Air Compressor Buyer's Guide - Find Out How To Pick The Perfect Two-Stage Air Compressor. Our air compressor how-to library can help you pick the perfect single-stage air compressor, two-stage air compressor, rotary screw air compressor, air tool, or air compressor accessory.